Flat is ideal for dining rooms and bedrooms because of its smooth finish, excellent coverage and great hiding performance. This durable product provides a mildew-resistant coating and features easy soap-and-water cleanup. Eggshell is ideal for living rooms and foyers because of the subtle, velvet-like sheen and excellent coverage. It provides a highly washable, stain-resistant finish that is easily cleaned with common non-abrasive, mild household detergents. This durable product provides a mildew-resistant coating and features easy soap-and-water cleanup. Satin is ideal for family rooms and great rooms because of the subtle, satin-like sheen and excellent coverage. It provides a highly washable, stain-resistant finish that is easily cleaned with common non-abrasive, mild household detergents. This durable product provides a mildew-resistant coating and features easy soap-and-water cleanup. Semi-Gloss is ideal for high-traffic areas such as kitchens, bathrooms and kids’ rooms because of its heavy-duty, chip-resistant finish. It provides a highly washable, stain-resistant finish that is easily cleaned with common non-abrasive, mild household detergents. This durable product provides a mildew-resistant coating and features easy soap-and-water cleanup. 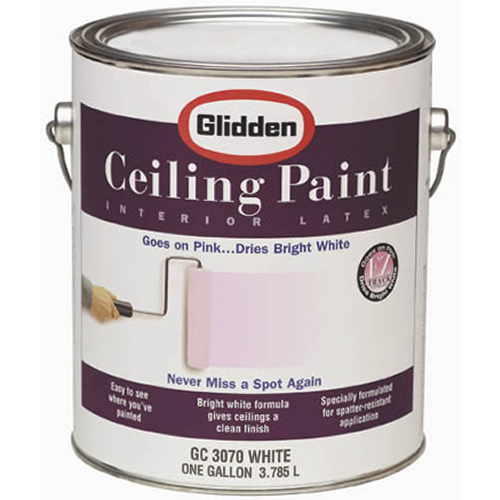 This ceiling paint goes on pink to see where you are painting in white on white applications or low light. Never miss a spot again! Dries to smooth white finish hiding imperfections Apply at 300 sq ft/gal. Actual coverage may vary depending on substrate and application method. 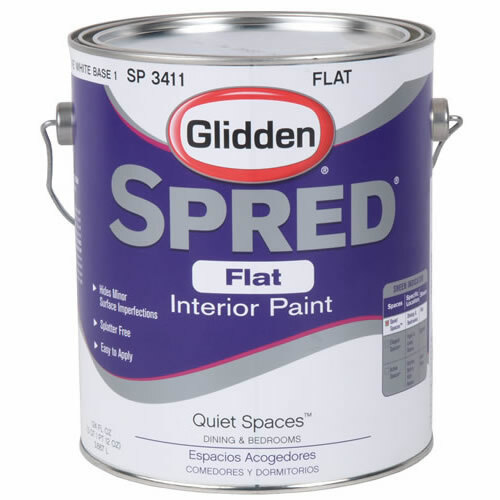 This Glidden Spread Quiet Spaces Flat White Interior Paint is a high-hiding, washable latex paint for walls. Great for dining and bedrooms. Its flat sheen adds a uniform appearance to irregular surfaces. 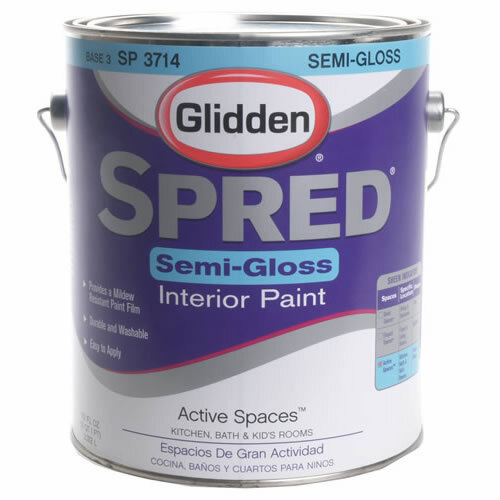 Glidden Spred Interior Base 3 Enamel is an excellent choice for walls and trim and is both washable and extremely durable. Its semi-gloss sheen highlights trim surfaces without appearing harsh. Great for Active Spaces such as kitchens, baths and kids rooms. 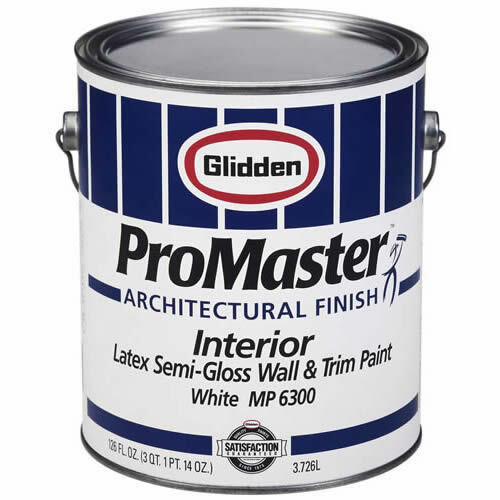 Glidden ProMaster Architectural Interior Paint is developed for the professional painter to use in homes, hospitals, hotels, schools, malls where architectural finishes are specified. Available in Lo-luster, eggshell and semi-gloss sheens for interior and exterior applications. Dries in 30 minutes, recoat in 4 hours Combines high-hide with washability in a fast drying finish. Tintable in a wide range of colors. 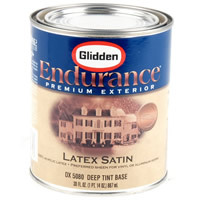 The Glidden Endurance Latex is the best 100% acrylic latex for hiding and durability. Preferred sheen for vinyl or aluminum siding. Proudly displays the Glidden assured satisfaction limited warranty. Excellent hiding and durability. Sheen reflects like new aluminum siding Can be used on plywood, masonry, or over previously painted surfaces.